The prediction of climate change associated with human activities is one of the most pressing challenges of science. The modern approach to its solution is based on the use of mathematical models of the climate system, which are currently being intensively developed in many scientific teams of the world. Global climate change is very complex, so modern science cannot give a definite answer about what awaits us in the near future. There are many scenarios for the development of the situation. Earth is a very large and complex system. It consists of various components that are related to each other. The atmosphere on the planet is moving, the movement of air masses distributes thermal energy across the planet’s latitudes, there is a huge accumulator of heat and gases on Earth – the World Ocean. Changes in such a complex system cannot happen quickly. Centuries and millennia will pass. This is the most “popular” scenario at the moment. According to various estimates, over the past hundred years, the temperature on Earth has increased by 0.5–1° C, the concentration — CO2 has increased by 20–24%, and methane by 100%. In the future, these processes will continue and the average temperature of the Earth’s surface may increase from 1.1 to 6.4° C by the end of the 21 century, compared with 1990. Further melting of the Arctic and Antarctic ice can accelerate global warming processes due to changes in the albedo of the planet. According to some scientists, the ice caps of the planet cool our Earth by 2° C and the ice covering the ocean surface significantly slows down the heat exchange processes in the atmosphere. In addition, there is practically no main greenhouse gas above the ice caps since it is frozen. Global warming will be accompanied by a rise in world ocean level. From 1995 to 2005, the level of the World Ocean has already risen by 4 cm, instead of the predicted 2 cm. If the level of the World Ocean will continue to rise at the same rate, then by the end of the XXI century the total level of its rise will be 30 – 50 cm, which will cause partial flooding of many coastal areas, especially the populous coast of Asia. Many people live at a height of less than 88 centimeters above sea level. In addition to rising sea levels, global warming affects the force of the winds and the distribution of precipitation on the planet. As a result, the frequency and scale of various natural disasters will double. Today, 2% of all land is suffering from drought, according to some scientists, by 2050, drought will cover up to 10% of all continental lands. In addition, the seasonal distribution of precipitation will change. One of the factors in the occurrence of ocean currents is the gradient (difference) of temperatures between the Arctic and warm waters. Melting polar ice increases the temperature of the Arctic waters, which will lead to a slowdown of the currents in the future. One of the most famous warm currents is the Gulf Stream, thanks to which in many countries of Northern Europe the average annual temperature is 10 degrees higher than in other similar climatic zones of the Earth. Stopping this oceanic heat conveyor will greatly affect the Earth’s climate. Today, the Gulf Stream current has become weaker by 30% compared with 1957. Mathematical modeling has shown that raising the temperature by 2-2.5 degrees can stop the Gulf Stream completely. Currently, the temperature of the North Atlantic is already warmed by 0.2 degrees compared to the 70s. If the Gulf Stream stops, the average annual temperature in Europe will continue to drop by 1 degree every year. Other scientists “promise” a stronger cooling of Europe. According to these mathematical calculations, the complete stop of the Gulf Stream will occur in 20 years, as a result of which the climate of Northern Europe, Ireland, Iceland and Great Britain can become colder by 4-6 degrees, rains increase and tornados occur more often. Cooling will affect many countries on different continents. By the end of 2030, warming in Europe will resume under scenario No. 2. The halt of the Gulf Stream and other oceanic currents will cause global warming on the Earth and the onset of the next ice age. Greenhouse catastrophe is the most “unpleasant” scenario of the development of global warming processes. According to some scientists, the average annual temperature on Earth increases due to an increase in anthropogenic CO2 content in the Earth’s atmosphere. This will cause a transition to the atmosphere of CO2 dissolved in the ocean and also provoke decomposition of sedimentary carbonate rocks with additional carbon dioxide emission, which, in turn, will raise the temperature on Earth even higher, which would entail further decomposition of carbonates lying in the deeper layers of the earth’s crust. Glaciers will melt intensively, reducing the albedo of the Earth. Such a rapid increase in temperature will contribute to an intensive influx of methane from thawing permafrost, and an increase in temperature to 1.4–5.8° C by the end of the century will contribute to the decomposition of methane hydrates (icy compounds of water and methane) concentrated mainly in cold places of the Earth. If we consider that methane is 21 times stronger greenhouse gas than CO2, the situation on Earth will be disastrous. If you want to better imagine what will happen to Earth, you should pay attention to our solar system neighbor, the planet Venus. It has the same atmospheric parameters as Earth, so the temperature on Venus should be only 60° C higher than Earth’s (Venus is closer to the Sun) i.e. around 75° C, but in reality, the temperature on Venus is almost 500° C. Currently, the atmosphere of Venus consists of 98% of CO2, which leads to an increase in the planet’s temperature by almost 400° C. If global warming follows the same scenario, then the temperature of the surface layers of the atmosphere on Earth can reach 150 degrees. Increasing the temperature of the Earth even at 50° C will put a cross on human civilization, and an increase in temperature by 150° C will cause the death of almost all living organisms on the planet. Some scientists say: if the amount of CO2 entering the atmosphere remains at the same level, then the temperature will be 50° C, it will be established on Earth in 300 years. This progress cannot be stopped, CO2 emissions are increasing with each year. According to a realistic scenario, CO2 emissions will grow at the same rate, doubling every 50 years, and the temperature of 50° C on Earth will already be established in 100 years, and 150° C in 300 years. How Reliable is Climate Modelling? Indeed, there are various difficulties in predicting climate. The behavior of the sun is difficult to predict. Short-term interventions like El Niño or volcanic eruptions are not easy to model. Nevertheless, the main impacts driving climate are well understood. Skeptics say that we should wait until the climate models become completely accurate. If we wait for 100% accuracy, we will never take action. Models are constantly in development, include more processes, use less approximation. Besides, computer productivity increases. The complex and non-linear nature of climate means that refinements and improvements will always continue. The main thing is that we already know enough to act now. Models in their development have reached the stage at which they successfully predict long-term trends and now they are developing their ability to predict more chaotic, short-term changes. Multiple lines of evidence, both empirical and model-based, show us that global temperatures will change by 3° C with a doubling of CO2 (Knutti & Hegerl 2008). Models do not need to be precise in all respects in order to give us an accurate overall trend and its main consequences. If you know about a 90% chance of getting into a car accident, you will not get into the car (or at least you will fasten your belt). The Intergovernmental Panel on Climate Change (IPCC) concludes that man is the cause of global warming with more than 90% probability. It’s reckless and irresponsible to wait for 100% confidence to act. Climate modeling helped to predict many phenomena, which were subsequently discovered in reality. 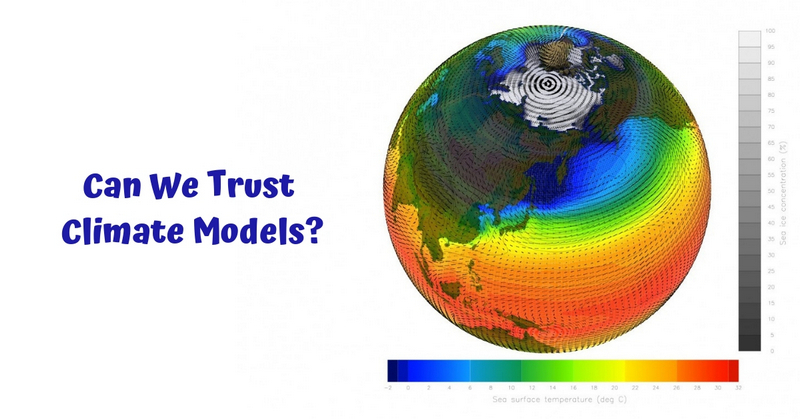 So the answer is YES, models can be trusted in predicting climate change.